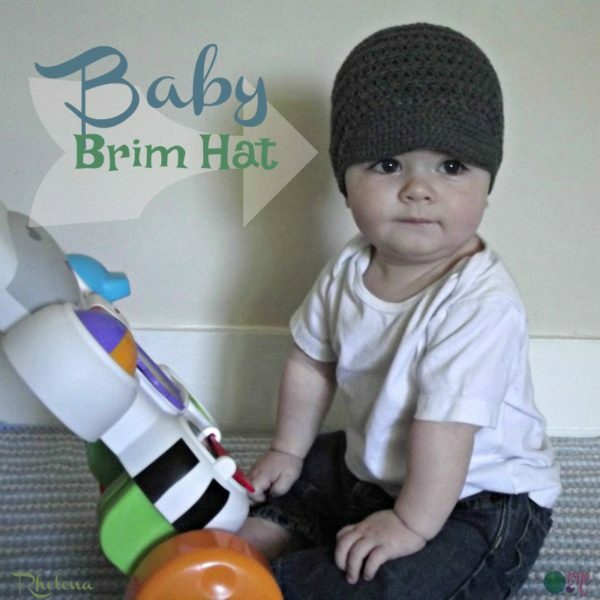 Here is a basic baby brim hat to fit a 6-12 month old baby. 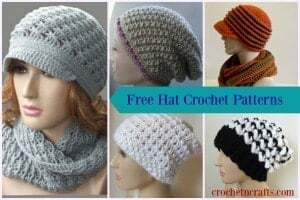 It’s crocheted in a grey for a baby boy, but I imagine a pretty pink or purple would look just as lovely for a baby girl. For a brim hat, it’s a bit long, but I wanted something to kind of block the eyes while still keeping his ears warm in the cooler weather. 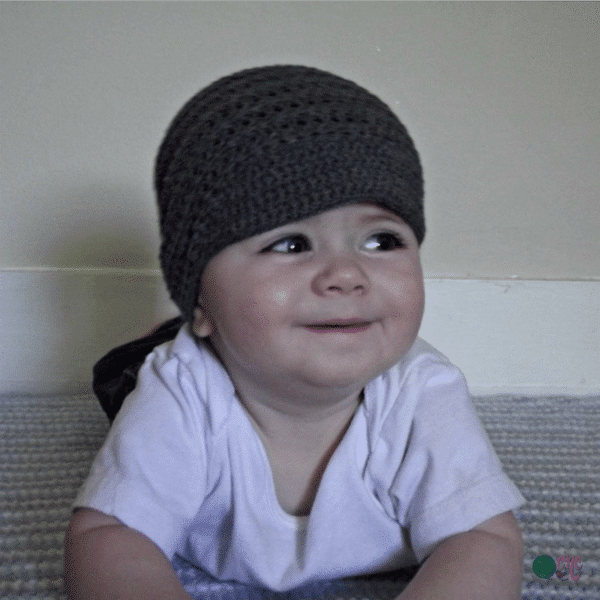 If you want a shorter hat for the warmer weather, just omit a few rounds at the end so it sits above the ears. The brim is okay at first, but tends to get floppy after a while, so you do need to stiffen it. I used a mixture of glue and water. Optional: Small amount of glue and water to stiffen the brim. Gauge: 1.25″ over first 2 Rnds. Finished Size: 6-12 Months. Laying flat it measures 7.5″ across and 6″ top to bottom, not counting the brim. 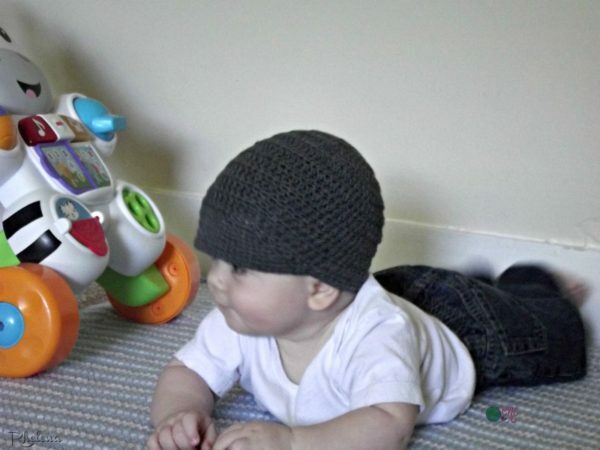 (Modeled on a 7.5 month old). Rnd 1 (RS): Ch 2, work 8 hdc in 2nd ch from hook. Join with sl st in first hdc. Turn. Edging: With RS facing, ch 1, sc evenly around; join with sl st in first sc. Fasten Off. 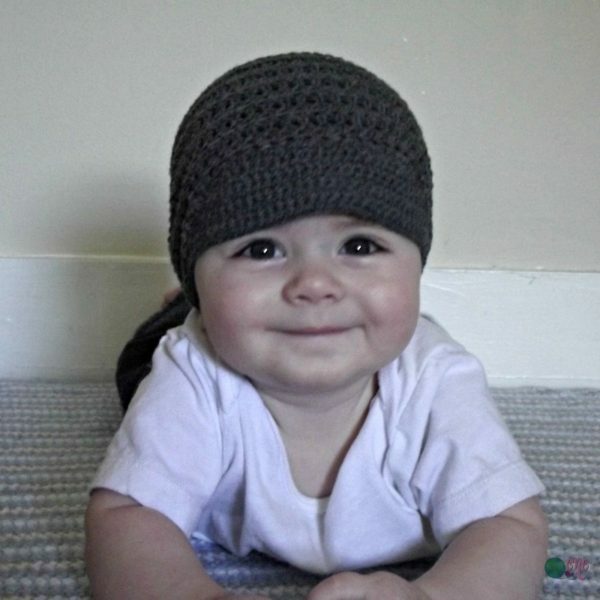 And don’t forget to check out more baby patterns here on CNC, or check out the growing collection of Baby Hats on CPB.